Never Enough Nails: Sally Hansen Sets Fall Ablaze! So the other day I dropped into my favorite drugstore for nail polish browsing, Harmon. I went to "see what they had" and we all know what happens on that kind of drugstore trip. I was pretty well-behaved however, and I only got a few things. I happen to think that today's post is SUCH a drugstore gem though! Sally Hansen Bronze Ablaze is my favorite drugstore polish in a long time! Read on and look at the many drool-worthy pictures I have included for your viewing pleasure! 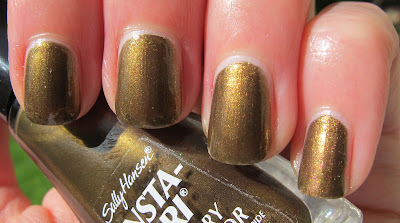 Sally Hansen Insta Dri Bronze Ablaze is a gorgeous, multi-faceted color. It's bronze, for sure, but in certain lights/at different angles, it flashes green, gold, copper, brown, even a few hints of yellow sparkle! I think this looks like a MUCH more expensive polish than it is (I think I paid under $4). In fact, Bronze Ablaze packs the pigment I thought was missing from NARS Desperado. Bronze Ablaze is opaque in one coat, but I think two coats brings out all of it's multi-dimensional goodness. It is from the Insta Dri line and unlike some Insta Dris I have tried, it does dry very quickly! I added CND Super Shiney top coat, as I thought it would look best shiny. It isn't matte or dull by itself, but a clear top coat brings out all of the sparkle. The formula was fabulous, absolutely no complaints. Again, it seemed more expensive! Polishes like this make me want to punch myself when I buy a Chanel. If all this goodness is available at $4, what am I doing dropping $25 on polish??? If you haven't ever used a SH Insta Dri polish, the brush is a little different. It is designed to supposedly cover the nail in one stroke, but I don't bother to do that. I do my usual three strokes, and I find that the brush is very nice after you get used to it. But it does take a bit of practice! I am assuming Bronze Ablaze is new for fall. Harmon had a new-ish looking display of Insta Dris with Bronze Ablaze, a pretty silver, a teal kind of color and a few red/wine type colors. This is definitely a MUST HAVE and will be on my nails AND toes a LOT this fall. I hope Sally Hansen does more polishes with this kind of dimension and high quality formula. This is one EXCELLENT polish. 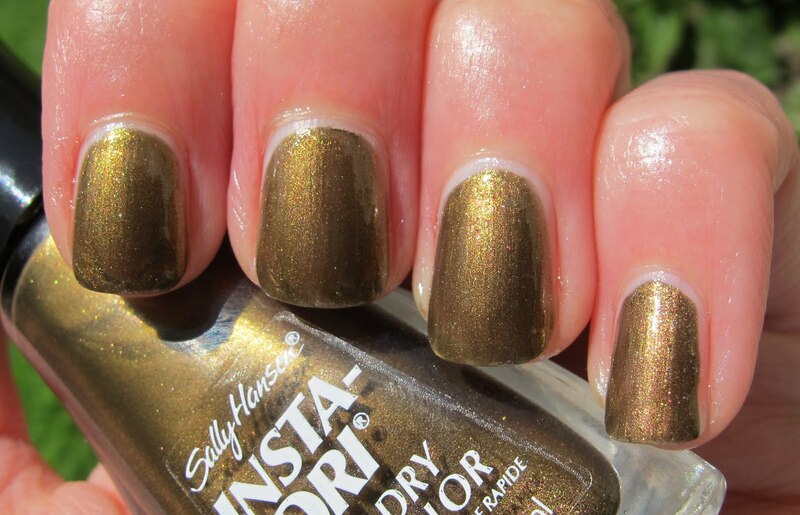 Sally Hansen Insta Dri polishes are available at a drugstore near you! Wendy- I wish all drugstore polish was this pretty and unique! Hope you find it!